942 South Shady Grove Road  , Memphis, Tennessee , U.S. In the 1990s, FedEx Ground planned, but later abandoned, a joint service with British Airways to have BA fly a Concorde supersonic jet airliner to Shannon, Ireland with FedEx packages on board, and then FedEx would have flown the packages subsonically to their delivery points in Europe. Ron Ponder , a vice president at the time, was in charge of this proposed venture. FedEx is organized into operating units, each of which has its own version of the wordmark designed in 1994 by Lindon Leader of Landor Associates, of San Francisco. The Fed is always purple and the Ex is in a different color for each division and platinum for the overall corporation use. The original FedEx logo had the Ex in orange; it is now used as the FedEx Express wordmark. 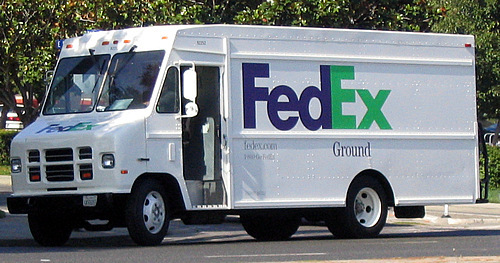 The FedEx wordmark is notable for containing a subliminal right-pointing arrow in the negative space between the "E" and the "X", which was achieved by designing a proprietary font, based on Univers and Futura , to emphasize the arrow shape. In August 2016, FedEx announced that all operating units will switch over to the purple and orange color logo over the next 5 years. A Federal Express McDonnell Douglas MD-11 in 1995. Caribbean Transport Services : Until 2008, a part of FedEx Freight . Provides airfreight forwarding services between the US mainland, Puerto Rico , the Dominican Republic , and other Caribbean islands. FedEx Trade Networks (Platinum "Ex", formerly yellow): Provides services relating to customs , insurance, and transportation advice. Formerly C.J. Tower & Sons, then Tower Group International. FedEx Supply Chain (Orange "Ex"): Provides logistics services including Critical Inventory Logistics, Transportation Management Services, Fulfillment Services, etc. Formerly Roadway Logistics System, then Caliber Logistics . 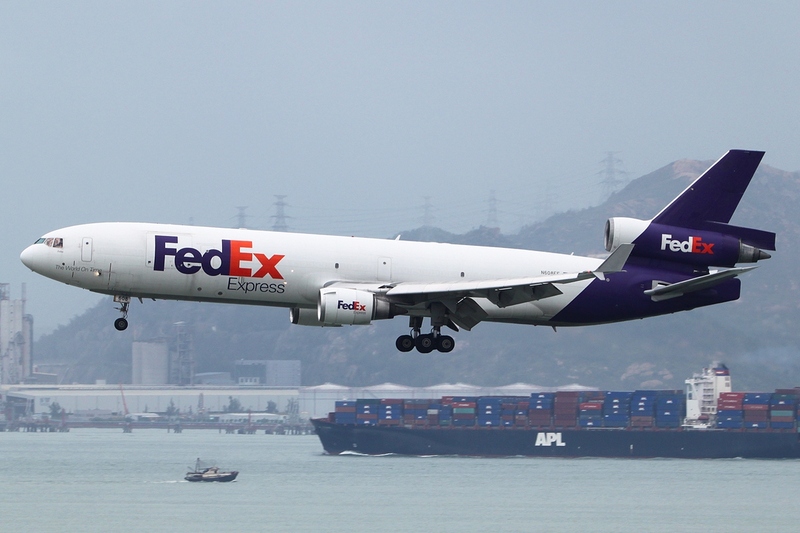 FedEx Express McDonnell Douglas MD-11 landing in Hong Kong on August 11, 2010. 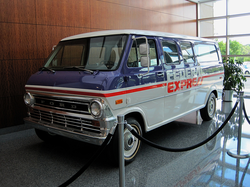 FedEx Freight, Inc : Formerly American Freightways , Viking Freight , and Watkins Motor Lines . FedEx Freight Canada : Formerly Watkins Canada Express . 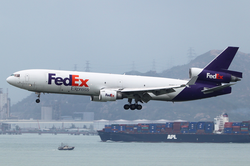 FedEx Custom Critical (Blue "Ex"): Delivers urgent, valuable, or hazardous items using trucks and chartered aircraft. Freight not accepted for transport includes perishable food, alcohol, medication, livestock, household goods, hazardous waste , and money. Drivers are independent contractors who own their vehicles. Service in Mexico uses interline carriers . Formerly Roberts Cartage or Roberts Express . FedEx Services (Platinum "Ex"): Provides global marketing, planning , and information technology (IT) services for the other FedEx operating companies. FedEx TechConnect (Platinum "Ex"): Offering a customer service toll-free telephone line for customer questions. It is operated by an automated operator then will prompt the user to a live agent for uses of tracking, claims, scheduling pick-ups (Express, Ground, Same Day, Custom Critical, Freight Express, and Freight LTL), compliments and complaints, locations (both staffed counter locations and drop-boxes), ordering supplies, setting up FedEx accounts, billing etc. Formerly FCIS or FedEx Customer Information Services . FedEx Office and Print Centers : Provides services such as copying, printing, Internet access and FedEx shipping. FedEx Ship Centers : Provides a central location for FedEx customers to deposit their packages for shipping, also offering a self-service photocopy and fax machine, office products for packing and shipping, boxes, and packaging services. Formerly, these locations were called FedEx World Service Centers . From 1997 to 2002, FedEx was the title sponsor of Champ Car World Series when it was known as CART . The series was known as the "CART FedEx Championship Series", which led to the official "Champ Car" designation in reference to the fact they were the FedEx Championship. 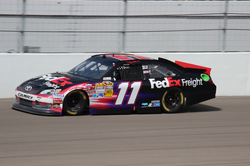 FedEx became the sponsor of the No. 11 NASCAR Sprint Cup Toyota owned by Joe Gibbs Racing and driven by Mike Bliss , Jason Leffler and Denny Hamlin in 2005. 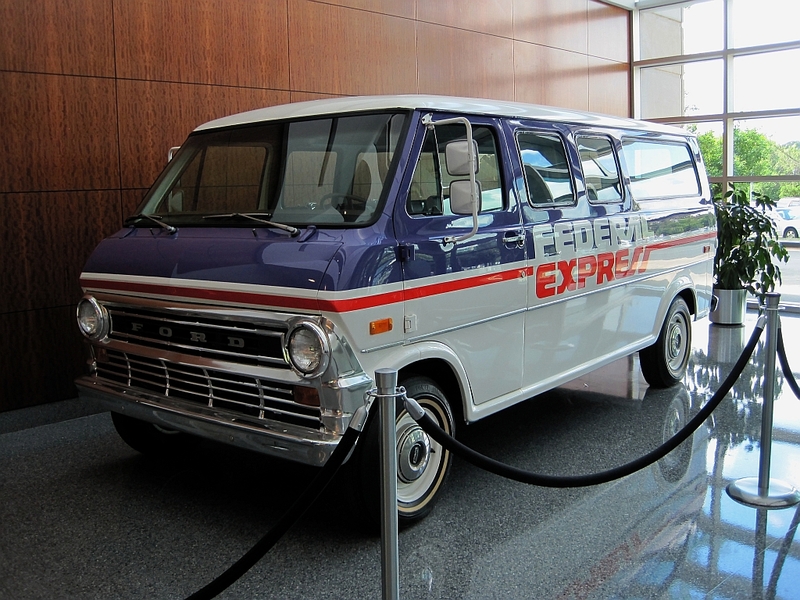 FedEx uses four (predominantly black) paint schemes to showcase its different products (Express, Freight, Ground, and Office), and in 2005 also ran a special scheme to promote a charity event at the FedEx St. Jude Classic golf tournament. 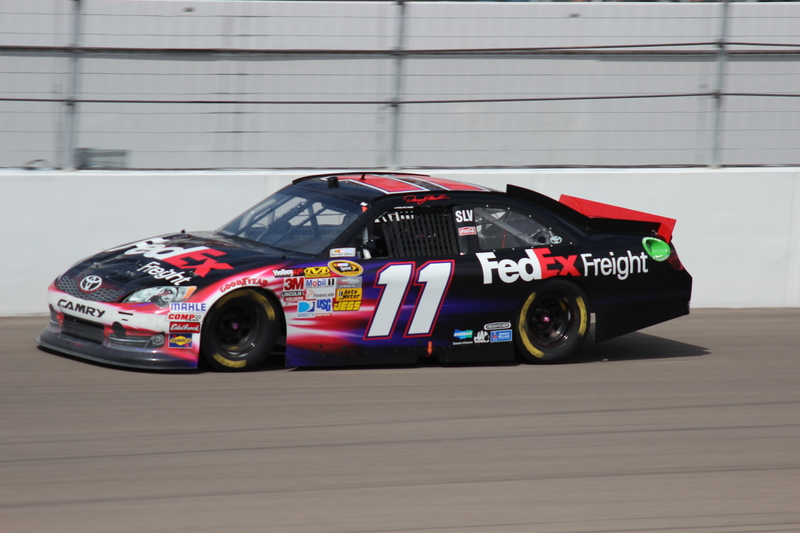 The 11 car has been driven on a permanent basis by Hamlin since 2006. FedEx previously sponsored the Formula One team McLaren . Prior to that FedEx had sponsored Ferrari , Benetton , and Williams F1 . FedEx does not currently sponsor any F1 team. FedEx is the Main Sponsor of the UEFA Europa League since 2015. All information for FedEx's wiki comes from the below links. Any source is valid, including Twitter, Facebook, Instagram, and LinkedIn. Pictures, videos, biodata, and files relating to FedEx are also acceptable encyclopedic sources. "Connecting People and Possibilities: The History of FedEx"
" The Marketing Doctor Says: FedEx Does It Again!" "IRS says FedEx may owe $319 million"
"UPS, FedEx "Brown Bailout" battle rages on"
"FedEx Corp. Announces Henry J. Maier to Succeed David F. Rebholz as President and CEO for FedEx Ground"
"FedEx indicted for drug dealing. Not a delivery guy — the whole company." "FedEx Indicted For Its Role In Distributing Controlled Substances And Prescription Drugs"
"FedEx charges raise online pharmacy issues"
"A trial accusing FedEx of knowingly shipping illegal prescription drugs just ended suddenly"
"FedEx: Justice Department Dismisses Charges Over Online Pharmacy Shipments"
"Feds Drop Charges Claiming FedEx Knowingly Trafficked Illegal Prescription Drugs"
"FedEx to buy rival TNT Express for €4.4bn"
"FedEx to buy Dutch Delivery Company TNT for 4.4 billion euros"
"WATS Scheduled Freight Tonne – Kilometres"
"Current Report Sept 2004, Inc 2004 Current Report, Form 8-K, Filing Date Sept 22, 2004"
"Donors get good seats, great access this week"
"Some question inaugural's multi-million price tag"
"100 Best Companies to Work For 2013 - FedEx Corporation - Fortune"
"and Rugby - The Heineken Cup - FedEx | United Kingdom"
"Prepare thoroughly. Commit totally. Deliver." Other wiki pages related to FedEx.